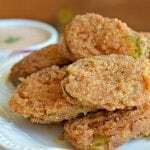 Inside: Deep fried dill pickles are a perfect appetizer for just about any occasion, and now you can make them from your own kitchen with just a few simple ingredients. Para Leer En Español, Haz Click Aqui. The first time that I tried deep fried pickles was at a popular steakhouse here in Colorado. I have never been a huge fan of pickles, so I was a little bit hesitant when I saw this on the appetizer menu. However, my husband convinced me that we should try them, and I am glad that he did! They were hot and crispy straight from the kitchen, which made them so delicious. Since we don’t go out to eat too often, I decided that I had to try to make these at home. Since I already had a recipe for onion rings, I figure that the same batter and seasonings I used for that recipe, would go great with pickles. Fortunately, that was a good assumption and these turned out really good as well. The first step to making fried pickles is to choose which variety of pickles that you are going to use. Pickles are very popular here in the United States as a topping for hamburgers and hot dogs. They come in many varieties – dill, bread and butter, and sweet to name a few. You can use them on their own or you can make dressings with them if you are really adventurous. They come whole, sliced lengthwise, or cut into round discs, and they are delicious! For this recipe, I decided to use the hamburger sliced dill pickles. I personally think that dill pickles are the best for fried pickles, but you can always try another variety as well. 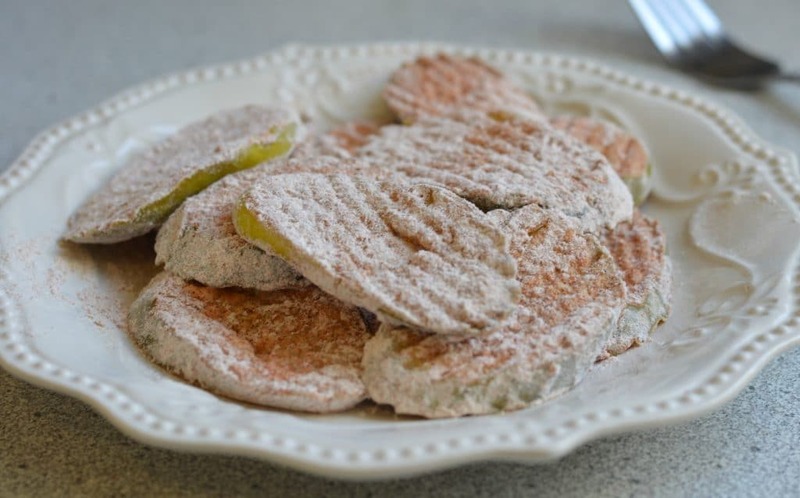 After you choose the right pickles, all you have to do is create the batter (as shown in the recipe below). You will then coat each pickle in the wet mix and the dry mix before dropping them into the deep fryer until they are crispy and golden brown. Although you can just eat these plain, I find that they are even better with a tasty sauce. 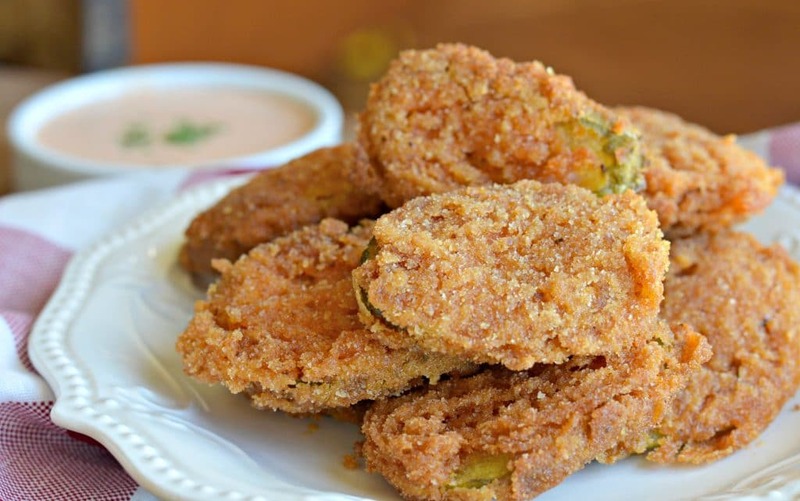 Fried pickles are good with ranch dressing, barbecue sauce, or even ketchup. However, the sauce that I love to make is a chipotle-dill crema. It keeps with the “dill” theme, and adds a perfect amount of freshness to this recipe. The chipotle-dill crema is easy to make and you can find the recipe below as well. Make sure that you eat these when they are still hot and crispy – you won’t regret it! The following products are very helpful when making this fried pickles recipe. 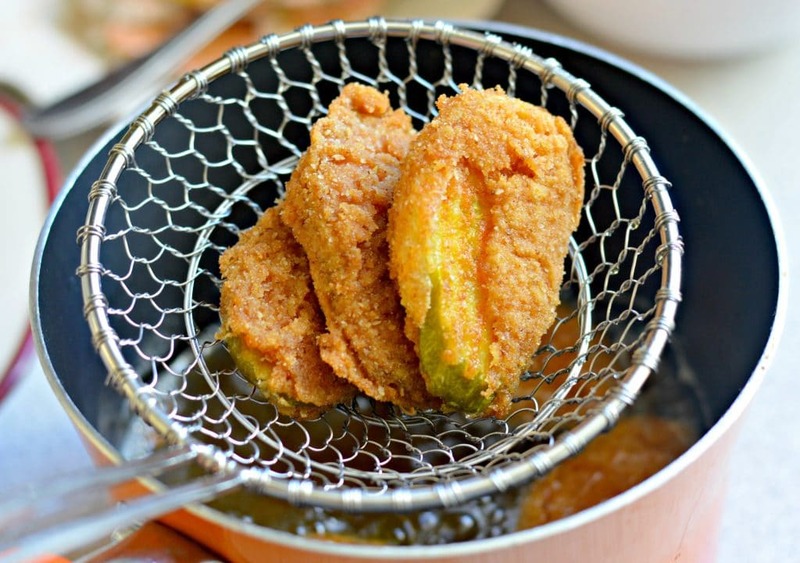 Fryer: You will need to have a high quality fryer when making these fried pickles. This is a great option, but you can really use any that you want. Measuring Spoons/Cups: You are going to need to measure all of the different ingredients that you use to make this recipe. I don’t know about you, but my measuring cups always seem to get separated, and sometimes I can’t find the one I need. I recommend this set, because it has the spoons and cups all together, is stainless steel, and has a solid ring to keep them together. Kitchen Prep Bowls: Since you have to use multiple bowls in this recipe, you should have some good kitchen prep bowls. I like these ones, because they can be used to prep and they are good for serving as well. Condiment Bowls: These fried pickles go great with many sauces, including our homemade ranch. You will want to have some of these condiment bowls on hand so that you can try it with as many different sauces as you want. Deep fried dill pickles are a perfect appetizer for just about any occasion, and now you can make them from your own kitchen with just a few simple ingredients. 1-2 Chipotle Peppers in Adobo sauce less or more depending on how spicy you want it. Drain the liquid out of the jar of pickles and strain in a colander for about 15 minutes until no liquid remains. Combine the flour, baking powder, salt, pepper and paprika in a medium sized bowl. Coat each pickle in the above mixture and set aside. Combine the remaining flour-mixture with the milk, egg, and a pinch of salt and mix well until no lumps remain. Coat each pickle in the above batter and shake away the excess. Coat each pickle in breadcrumbs. Fry the pickles in a fryer or a pot with hot oil. Combine all of the ingredients in a blender and blend to a smooth consistency. 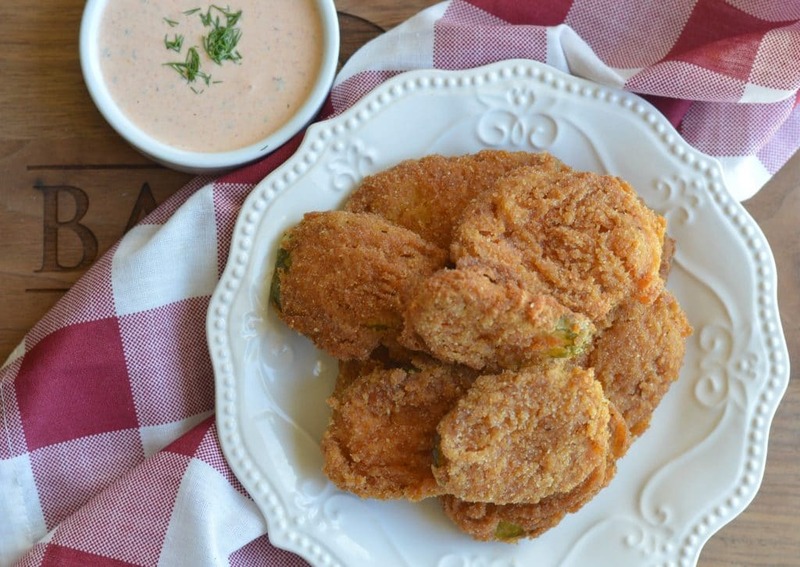 Serve with the hot fried pickles and enjoy! up to date with approaching post. Thank you 1,000,000 and please carry on the enjoyable work. A Chef friend turned me on to this new oil. Refined high oleic sunflower oil with 83% monounsaturated fat (the one doctors say is the good fat, same as in olive oil). It’s called sunvella frypure. So I’ve been experimenting with it and tried it on your recipe and the results were amazing. Thanks. Did any one else hear about it? Try it? What do you think? OMG these are EVIL! They are so good, I couldn’t stop eating them! I followed the recipe exactly. I used Panko breadcrumbs because that’s what I had, and they put it over the top! Hi Carlos – here is my recipe for horchata. https://www.mylatinatable.com/authentic-horchata-recipe/ – Good luck! The BEST Fried Pickles I ever ate! I used buttermilk and panko and they were amazing. I served them with homemade honey mustard sauce. These turned out great! Only thing I did wrong was cut up my own dill chips out of whole dills and I cut them too thick so the taste was a little overwhelming. But the batter stuck great and the taste of it was restaurant quality. Will definitely make these again! Oh, and I don’t know if they would have turned out as well had I not used my deep fryer!